I was going to splash out on some nice FedMod ones to go on the C, D and E. I have seen the poor decals in the box and it would take a lot of time for me to mask and paint. Being a new modeller I am very much the instant fix type of guy and not the long haul type modeller. mophius wrote: I was going to splash out on some nice FedMod ones to go on the C, D and E. I have seen the poor decals in the box and it would take a lot of time for me to mask and paint. If you are after an "instant fix" trust me: the new version decals are what you are looking for. Basically they were made having in mind to assemble the model, to lay down an overall base paint on the whole ship and then do ALL the rest with decals. 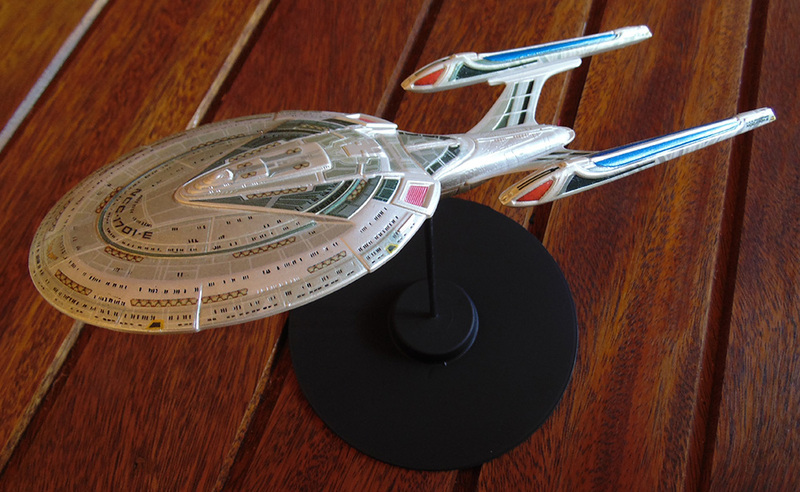 Trust me, ALL the details including the nacelles are decals! The ONLY thing I painted (beside the hull) were that two clear red squares in the back of the hull — sorry I don't know how it's called! — that were masked and airbrushed and the deflector that I painted by hand with a brush in brass. I built mine with Absolute Models decals; this was before the cadet series kits came out. They turned out really great Trekriffic as everything else you do! In comparison the Cadet series decals for the Ent-E has a greenish curve while the one you used from Absolute Models version are more grayish that gives a more flat/discreet look. Check below a picture of mine!